The way in which Göteborg wants to achieve this is interesting. By involving the people of the city, but also professionals and institutes like the Chalmers University the city wants to make sustainable plans for the future development of Göteborg. Up until now they are doing that very well. The vision document is filled with pictures of workshops and quotes from the citizens. The big question is if they will succeed in keeping everybody involved and creating truly mixed areas in the building projects as well. We have talked to Anna Braide Eriksson, a researcher on housing who teaches at Chalmers university. Chalmers is very involved in the development of the city. Students participate in the development of the city, for example in workshops on Frihamnen, one of the most prestigious development areas on the west bank of the river Älv. Chalmers also participates in ‘real’ projects as a knowledge partner. One of the examples is the project ‘Positive footprint housing’. Anna is both positive and sceptical. She is very positive about the ambitions of the city, especially in regard to other cities in Sweden. However, she is quite sceptical when it’s about the potential result of this involvement. As an example she mentions Kvillebacken, where the ambitions of the city in order to create a mixed, but delicate and nuanced development of the area were not achieved. The small scale mix of social groups and small businesses that characterised the old area totally disappeared and, according to Anna, have now been replaced by the generic Swedish buildingtypology of 7 to 8 stories apartments. We also spoke to Josefine Wikholm and Susanne Clase of White architects, one of the largest architecture firms in Sweden. They emphasize that Göteborg needs better functional, social and economical mixed areas and therefor more typological diversity. Both architects live with families in typical Swedish apartments. They immediately add that luckily they also have a weekend house to get out of the dense city and small living space. It is interesting that White has been acting as an initiator and developer of new typologies. In one of the Millionprogram areas, called Frölunda in the outskirts of Göteborg, they have developed the project ‘Äppelträdgården’. Together with the builder FO Peterson they have realized 19 terraced patiohouses for rent and sale. This development was not completely without risks, but White found it very important to develop these new typologies and show that this innovation could actually improve the quality of the neighbourhood. 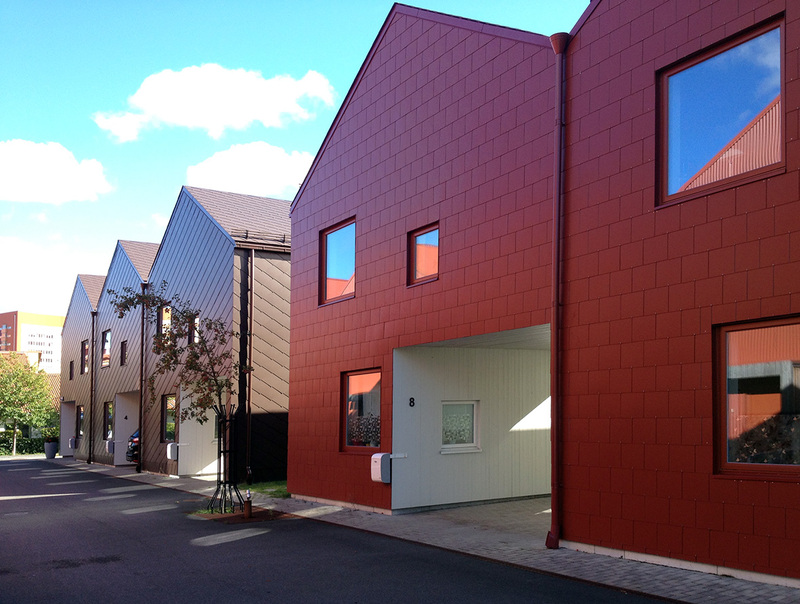 For this project they won the Swedish Housing Award 2011. Göteborg will select the first parties for development of Frihamnen this autumn. Frihamnen will be ‘the testbed for socially sustainable development’. Here the city wants to provide possibilities for new ways of living. It will be very interesting to follow the outcome of this process and see if these possibilities are taken up by developers and architects to generate new urban typologies and new living concepts. Oslo is the fastest growing major city of Europe. The city grows 2% each year and has grown 17% in the last 15 years. The urbanisation process is relatively new in Norway, were living with nature is in the genes of the people. But work has brought people to the city, and the city has to provide houses for those who want to move in. The unemployment rate in Norway is very low. Although some people fear a collapsing bubble after the oil, most people don’t worry too much about the economy, Norway has oil and huge reserves from that. Oslo is ranked number one in terms of quality of life, among European large cities in the European Cities of the future 2012 report by fDi magazine. It is also the second most expensive city in the world, in terms of living expenses (after Tokio). But there is definitely a downside to this positive story. Building production cannot keep up with the population growth. Therefor the prizes of land and houses are continuously rising. Developers, contractors and also architects make good business in this context. But to build houses that people can afford the tendency is to build smaller and denser. Of course the municipality is trying to regulate this, but the fact is that a family apartment is almost unaffordable for a regular family. One can imagine that lower income families are all pushed to the outer neighbourhoods of the city, whereas the new harbour front developments that form the main part of the city’s building land become inhabited by higher incomes and smaller households. We have visited Sørenga, one of the newest development areas along the harbour front, close to the Opera and still under construction. Here you can buy a bigger apartment of 110m2 or even 140m2, but the costs are extremely high: 9.900.000 NK for 113m2 (ca. 1,1 miljoen euro). Since the newly build areas are all very much concentrated along the Fjord this automatically leads to stronger segregation in the city. The new areas are hardly mixed in social terms and lack real life. This is also one of the points of critique in the debate among professionals and the public in Oslo. One of the representatives of this opinion is Johnny Aspen, associated professor at the Oslo architecture school, who talks about ‘zombie urbanism’. The regulations for building housing in Norway are also quit strict. Bathrooms, master bedrooms and storage space in the apartment are all defined in minimum size. One of the consequences of this is, according to all the architects we have spoken is that, especially in the big mass of smaller apartments, one ends up with relatively big bathrooms, bedrooms and storagerooms and a very tiny living space with a big kitchen and just enough room for a sofa. Another consequence is that the new areas are very dense. It is obvious that a lot of these very expensive apartments hardly get any sun, especially considering the low position of the sun in Olso. The Barcode project seems to beat all records. Although the area contains mainly office buildings, there are some housing slabs in this masterplan. MAD architects have designed an apartment slab in this area. They have tried to optimize living qualities by making very thin apartments with long facades, but these facades are rather closed and very shaded due to the urban plan. Apparently this is all well accepted in the tight housing market of Oslo. Bu it is also no wonder that all Norwegians dream of a small weekend house in the countryside, and in the middle and upper class the majority has one. There are some other more positive stories to tell about Oslo. In terms of densifying the city the work of developer Infill is interesting. Infill limits itself to develop the leftover spaces, the holes in the city’s fabric. On these tiny spots they develop attractive architecture and high living qualities. All their projects have serious roof terraces with real grass, real trees in real soil. We visited the project Green House, that was designed by Element architects. This building definitely adds quality to the neighbourhood. A zone around the building on street level integrates private outdoor spaces, but also public benches and therefor generates interaction with its surroundings. The projects of Infill do not offer more m2 for less money unfortunatly, because they have to work within the same land prize system, but they do add quality and diversity to existing older neighbourhoods. 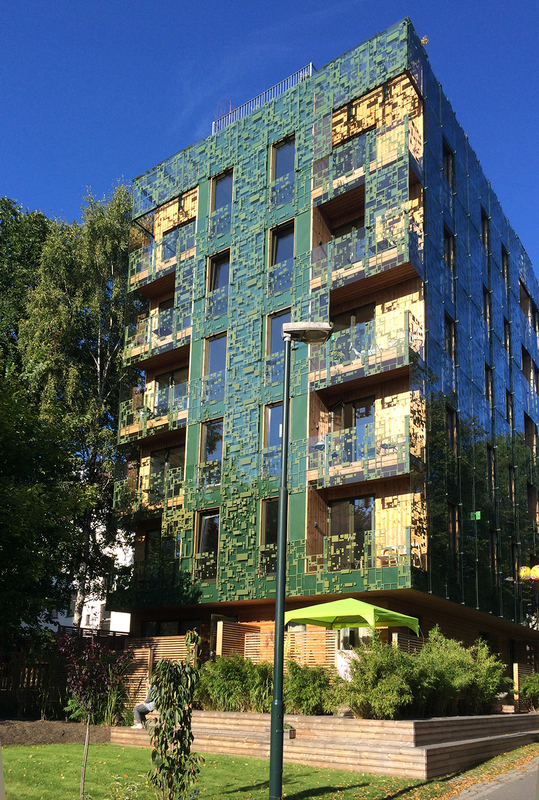 Housing in Sweden, struggle for quality? The demand for dwellings in most Swedish cities is enormous. 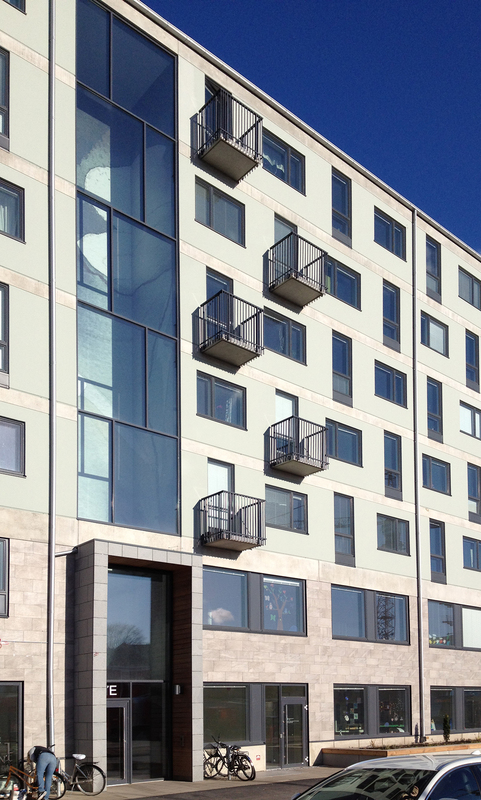 Stockholm in particular has to deal with a huge demand for living space. Until 2030 the amount of 140.000 houses has to be built in the Stockholm region. Politicians put a lot of pressure on the production dwellings in order to be able to house all the citizens. Due this enormous pressure the housing prizes in Stockholm are very high. This pressure on the housing market makes it hard to realize urban and architectural quality in new housing areas. High density is inevitable when land prizes are high. Striking is that in Stockholm the municipality owns most of the land, Nevertheless, the struggle for housing quality is a hard one. The building industry in Sweden is dominated by four big building companies who build around 80 percent of the total housing production. They operate both as developers and as total entrepreneurs. In Sweden, a total entrepreneur takes over the whole process , from design to building, after tendering. This situation differs a lot from other countries. For instance Denmark has around eighteen bigger building firms. These big four Swedish companies have a strong lobby in politics and have a lot of influence on the building sector in Sweden. 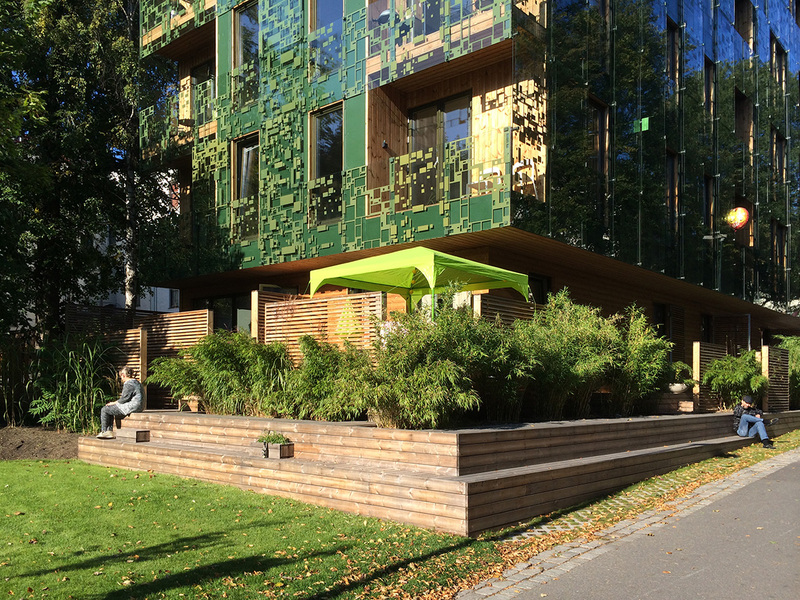 We have talked to Anna-Stina Bokander, coordinating project manager for the municipality of Stockholm on the new development area Norra Djurgårdsstaden. This area around the royal Seaport on the eastside of the city is one of the biggest developing sites of Stockholm. 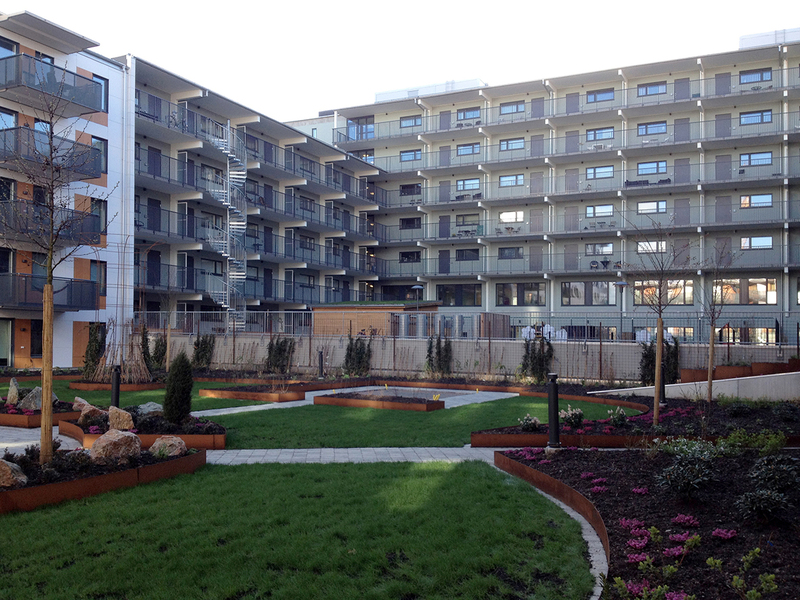 The plots in Norra Djurgårdsstaden are sold to developers and municipal housing companies. In the first phase of the development the plots were sold for the highest prize. In the second phase this strategy has been changed, in order to generate more spatial quality and more architectural variety. Prizes were fixed by the municipality and the developers were selected through a competition on quality. In this phase the plots were also smaller, in order to create more space for smaller developers and builders. The plans that were selected show indeed a greater variety in comparison to the projects in the first phase. But the projects of the second phase are not built yet. There is still the risk that a lot of quality is lost in the building preparation phase. In Sweden, architects get an assignment to make a design, but are often not involved in the later stages of projects. It is very common that the projectering, as they call it in Sweden, is done by another, cheaper architect. The original architect plays no further role and is most often not consulted when things are changed in the project, which of course is very likely. 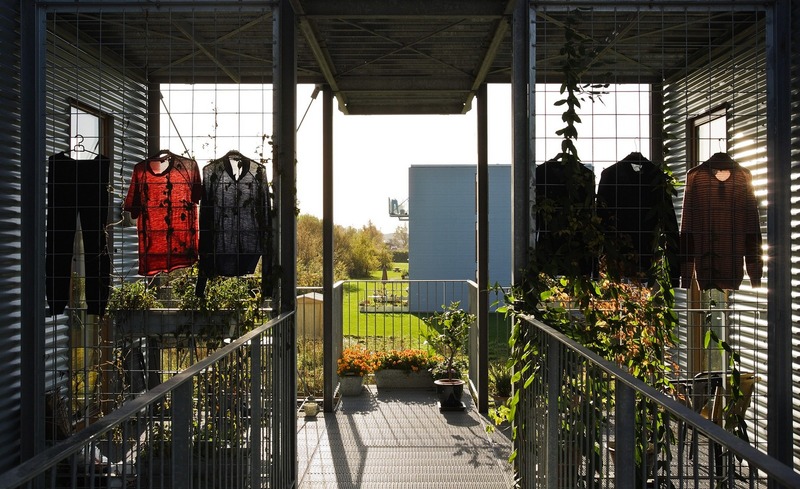 ­ All Swedish architects involved in housing complain about this phenomenon. Still, if you look at this discussion from a Dutch perspective, the Swedish situation is a bit strange. One wonders why there is so much pressure on land and why everyone complains about lack of housing qualities. After all, Stockholm has enough space. It is one of the greenest cities in the world. The city owns most of the land and has the tools to challenge developers to set a standard to housing qualities. Looking at Hammarby Sjöstad, a very centrally located development area from the ‘90s and 00’s, it seems that the city of Stockholm does have the capacity to make very attractive living environments. In Hammarby Sjöstad the city has developed a dense, mixed living area with good public transport and foremost great outdoor qualities. 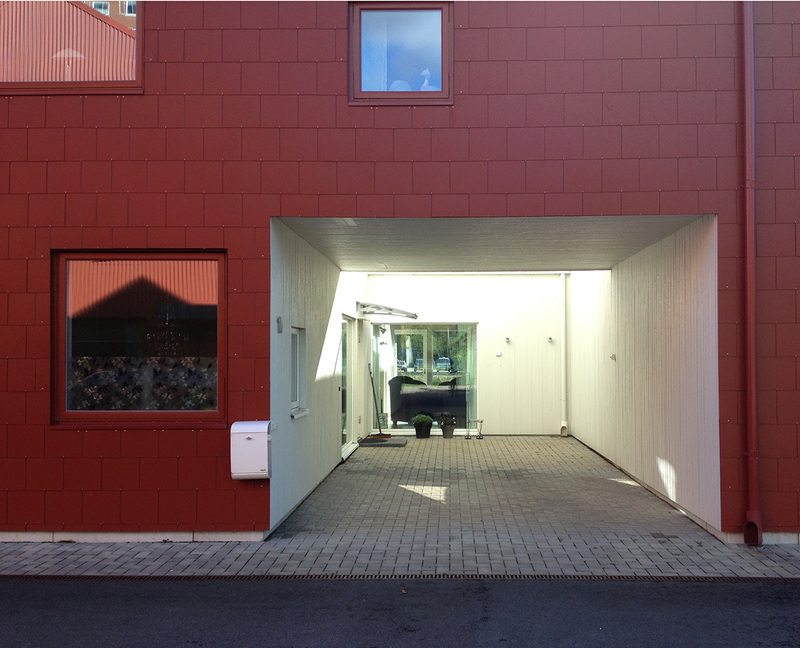 However, also in Hammarby Sjöstad it is clear that Swedish housing architecture is a bit boring and much of the same. Typological innovation is very scarce. New concepts for urban living patterns do not seem to be developed. So there are some challenges to deal with, but, from a Dutch perspective, it doesn’t look like a mission impossible at all. During our visit to Copenhagen it became clear that good architecture is perceived as an undeniable value, also in regard of the non-profit housing assignment in the capital. By all parties involved in the building industry, architects are considered well respected professionals and their contribution to the building assignment is, also in these times of financial crises, not in question. The non-profit housing assignment is probably the best example of this fact. Housing in Copenhagen is, as in probably most other countries in Europe, very much influenced by the economic situation. In prosperous times housing prizes rise, developers build and the municipality can try to convince the developers to add quality to the surroundings by realizing their projects. But under these circumstances, non-profit housing organizations can’t afford to build on the central locations, because they cannot afford the land. On top of this, housing is mostly market driven. As a result, only products that do well on the market are being developed. Under these circumstances it is almost impossible to build for the lower incomes. In periods of economic decline however, the non-profit housing organizations can buy land and build housing for the lower income groups. Still, there are numerous parties that put an effort in realizing affordable housing for starters and young urban inhabitants, also in prosperous times. Remarkably, it’s architects that come up with innovative, smart concepts. Besides, architects know how to integrate optimized building logistics in the design of good dwellings and agreeable living environments. This makes that architects are seen as an important party in the development of low-income housing. An interesting development is the Armenbolig+ concept of non-profit housing organization KAB, the biggest non-profit housing organization in the Copenhagen region. Stine Kofod explained the concept of prefabricated lowrise casco houses that was first developed by a coalition of an architect and a builder in order to offer affordable but spacious and architectural attractive housing for a low prize. Tenant’s take care of maintenance of their homes and outdoor space.The dwellings are delivered as a casco+, tenants can eassily change the interiorwalls, bathrooms, kitchens etc.. In return they pay low rents. The projects are up to 20% cheaper than other non-profit housing estates, 10% through the use of prefab solutions. The other 5-10% follows the new model for running it, where people take care of some maintenance themselves. 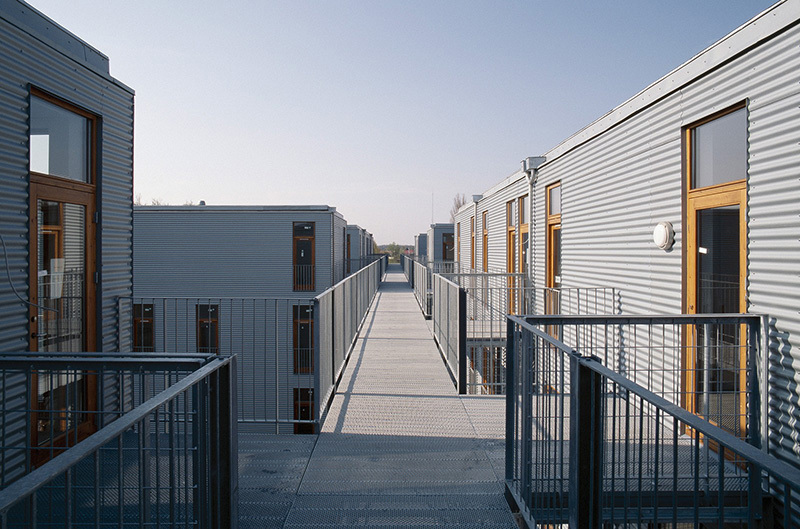 This principle was also used in the project Signalgarden in Copenhagen, by Lejerbo, where they built several blocks with different housing typologies. We have visited a maisonette of three stories accessed from a gallery. This is a uncommon typology for Denmark, even for Copenhagen. The inhabitants, a family with three children and a dog, are very happy with their house. They pay a relatively low rent for their 120 m2 flat, 1000 DK per month (ca. 1300 euro), this includes energy. In return the inhabitants of the block have to maintain their own collective garden and do some other maintenance jobs. The housing at Signalgarden looks well designed, the floor plans are clever, the facades smooth with expressive balconies, aluminum cladding and careful detailing of the common spaces. We have also met Flemming Frost of JuulFrost arkitekter who initiated and build the concept of Bedre Billigere Boliger (Better Cheaper Housing) in Ølby. They designed apartments that were built for half the prize of normal non-profit housing. The quality they achieved is, considering this reduction of the building costs, very remarkable. The main significance is, however, that they showed that affordable housing does not necessarily means a cheap, worn down at forehand and stigmatic architecture. These examples from Copenhagen show that in order to develop attractive and cheap housing solutions the architect can play a crucial role. A role that improves all aspects of the project: better, cheaper housing. The years 2000-2010 were a period of making big money on big projects in Copenhagen. A time in which also Ørestad started to be developed. Everything in Ørestad is big! The blocks, the roads, the spaces. Far too big according to the general opinion of people in Copenhagen, both professionals and citizens. Too big, both in terms of size and in terms of architectural attitude, in which the main focus seemed to have been on creating architectural icons instead of making a dynamic, vibrant city. From this point of view, an interesting shift is now taking place. The attention in urban development is now changing. The city architect of Copenhagen, Tina Saaby, told us that in the booming period her department used to focus on the quality of architecture. These days however, the attention is being directed to the interaction of buildings with its surroundings. The objective is much more than before to create more livable areas with dynamic ground floors. This ambition now becomes visible in a few small-scale developments in some of the new areas. 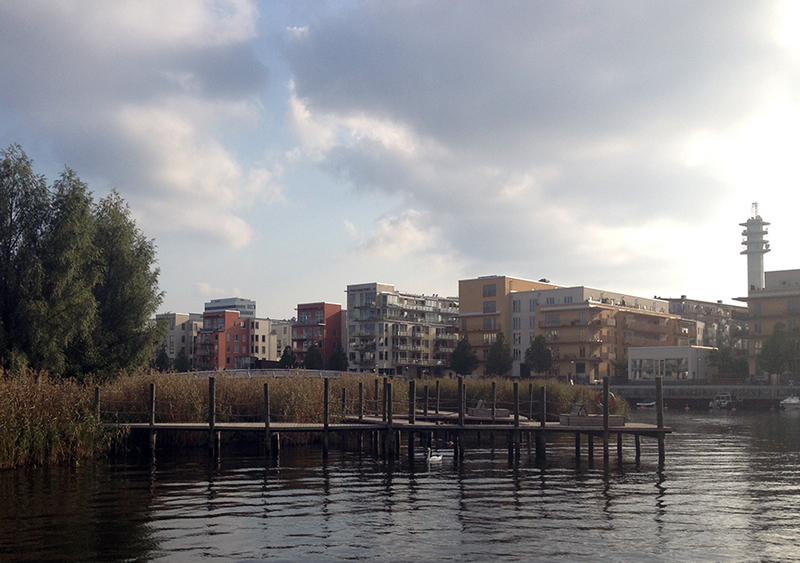 In Islandsbrygge for example we observed some low rise semidetached housing immediately next to few big towers. These row houses appeared to be still a bit lost, they didn’t really create a lively, dynamic new urban fabric. 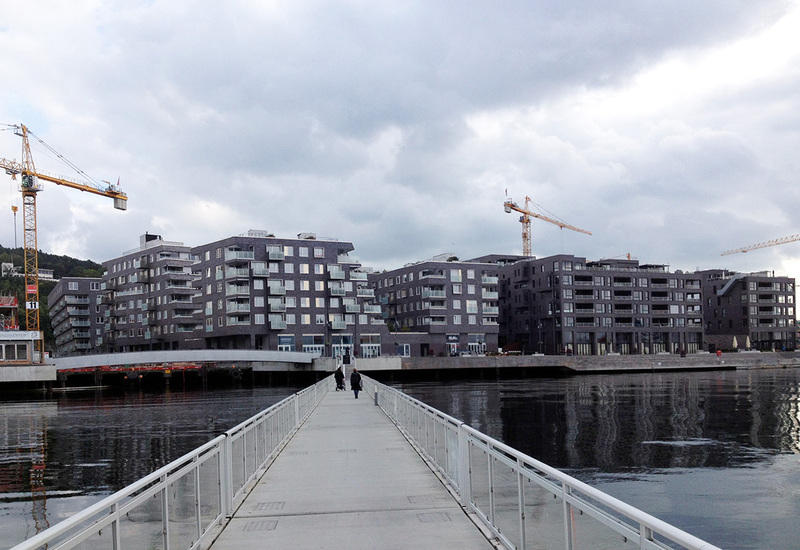 Also in Amager, along the newly made Amager beach, lowrise is being built among highrise towers. Apart from the poor architectonical quality (the attention seemed to have gone to other issues indeed) also here it is hard to imagine a dynamic, vibrant neighborhood where interaction takes place on ground level. 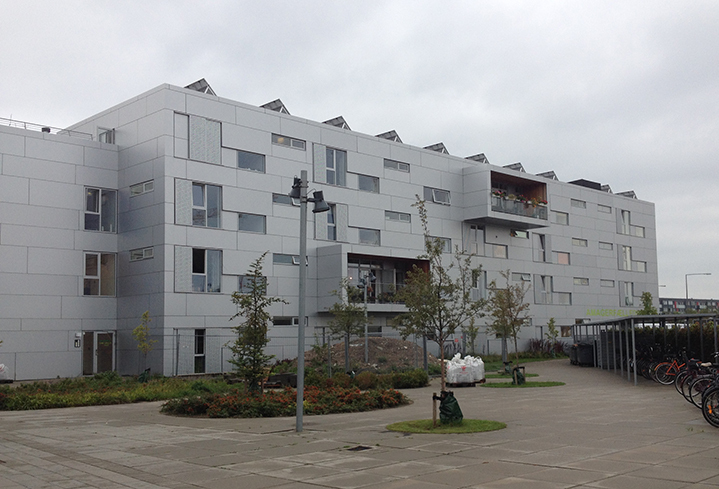 KAB, the main housing-association in the Copenhagen area, state that projects should not be too big. They have a lot experiences with large estates, such as Farum Midpunkt, that were built in de sixties and seventies. Both from a cost-efficiency and socio-democratic point of view, these estates exist of hundreds of dwellings of the same typology and size. Now times have changed, it appears that with the big scale of the projects, also the problems in the areas are blown up. And the large scale makes it hard to get proposals for improvement through the tenants democracy procedures. Therefore, KAB now aims to build smaller scale projects. With the projects, also the architectural offices have become bigger in the last decades. Due to the central and important position of the architect in building processes, for an architectural office it is fairly impossible to obtain new projects when the size of the office is under a certain minimum size. The architect is involved in the whole process, up to the controlling during the execution of the building. As a result, offices have to be able to offer a wide range of advice, varying from urban planning, design, to projecting and controlling. According to Jens Kvorning, professor at the Royal Academy of Fine Arts, School of Architecture in Copenhagen and specialized in the history and culture of the city planning in Copenhagen, this is why only a few big firms execute the far biggest part of the architectural assignment in Denmark. In Copenhagen, few firms with more than 350 employees are involved in the main part of the projects being build. But also midsize firms, such as Vandkunsten, founded in the seventies, has for a long time been a midsize firm with app. 20 employees, but recently grew to app. 55 persons. Also young offices will only survive when they grow big. For instance COBE has grown to 65 people within 5 years. The question is if and how Copenhagen can organize smaller scale developments and a better interaction between buildings and urban context. In this respect, planners, architects, the municipality and clients are very interested in the developments that take place in Amsterdam, where new developments have a smaller scale and where new players in new roles get possibilities to develop new, specific living concepts. This is very appealing to all the people we spoke to in Copenhagen. But at the same time they stated that such a development would be very hard to achieve since the city doesn’t own any of the land and therefor has limited say in the way new areas are developed. Maybe we can organize an exchange of experience between the Danes and the Dutch to inspire the Danes to strengthen small scale developments and the interaction between buildings and public life. In exchange we think the Dutch will be inspired by the way Danish housing associations and architects manage to achieve high quality housing while reducing the costs up to 20%!